The multi-select field within Dynamics 365 (CRM) was introduced with the release of version 9.0 (July Update). 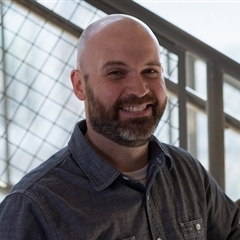 This new field opens up new possibilities for System Administrators and Customizers. So, let's get started with creating this new field. Once the field is added, we can do other things within Dynamics 365, such as Advanced Finds, related to this field. Now, to add the create the field, it's as simple as creating other fields. However, you need to understand which option to pick from the field types. Navigate to Settings > Customizations > Customize the System - OR - Solutions. If you utilize a custom Solution for your configurations and customizations, then open the correct solution file. Otherwise, when you click the "Customize the System" option, it will open the default solution. Once the solution file is open, navigate to a particular entity and click on "Fields". 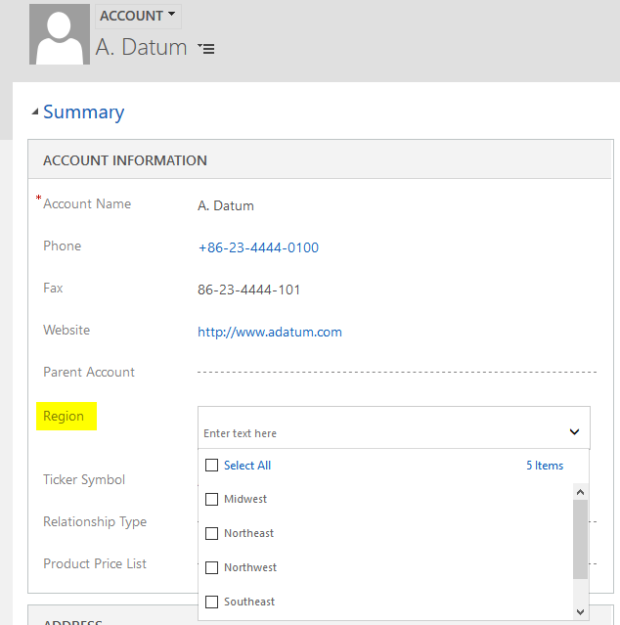 In this example, we will be adding the multi-select field to the Account form. However, you can also create the multi-select field in the global option sets area as well. Next, click the "New" button at the top of the list of fields. After you click the "New" button, you will see the new field window open. In our example, the new field will be called "Region". 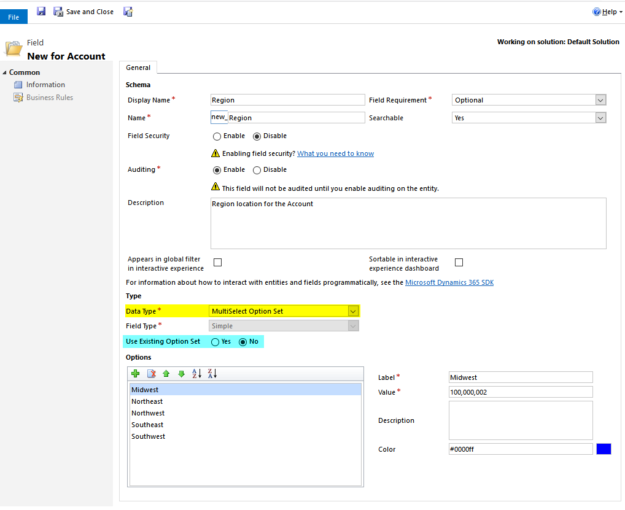 This field will show region options for the account. Keep in mind, that you will need to select the "Data Type" of "Multiselect Option Set". Also, if you started with a Global Option Set, then be sure to select "Yes" on the "Use Existing Option Set", and then pick the appropriate option set. After setting up the field, click "Save and Close". Obviously, the next step in the scenario is to add the field to the Account form. 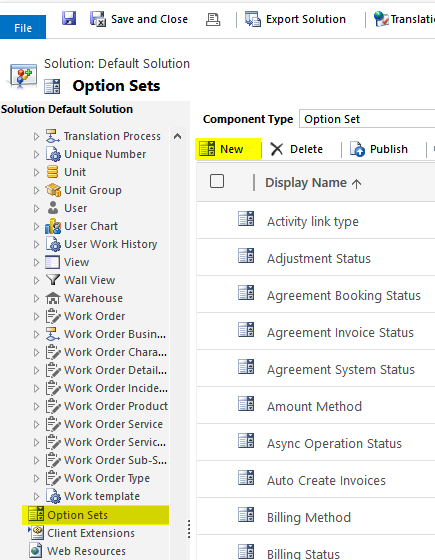 With your Solution file still open, expand the Account entity and select Forms. We will be adding the new field to the main Account form. 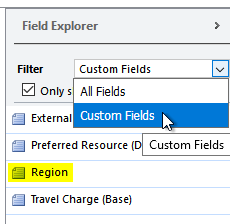 Now, with the Account form editor window open, select the new "Region" field. You can easily find custom fields by clicking the drop-down list and selecting "Custom Fields". 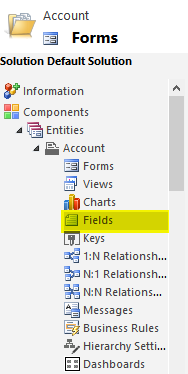 After finding the field, just drag and drop the field onto the form editor window in the desired location. 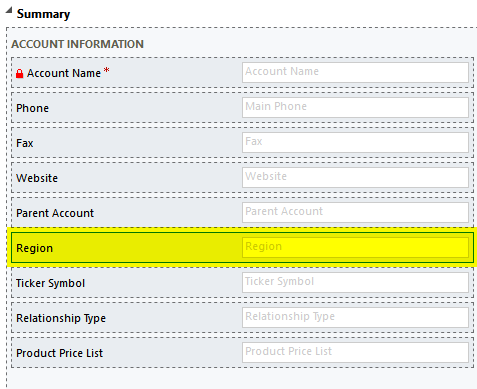 In this scenario, I have added the field to the Account Information section on the form. Once the field has been added to the form, be sure you click "Save" and then "Publish". You can now close the form editor window. You have successfully added the new multi-select field to the Account form. Congratulations! The next steps are checking if you can see the field, updating the field, and using the field in an Advanced find. Let's start by seeing if the field is on the form. The first step you may need to do is to refresh your browser. This will refresh the site and will update any of the new changes you just applied through the "Save" and "Publish" process. Next, open an Account record and look for the field. In the below example, you will notice the new field on the form and that I can see the options that I added to the option set list. To continue this scenario, I will update the field to show multiple regions and repeat this for a few Account records. In reality, you may not have an Account physically in multiple regions, but this is just for an example. After updating the field, be sure to Save the record. Now that the multi-select field has been updated on a few records, let's check out the Advanced Find! 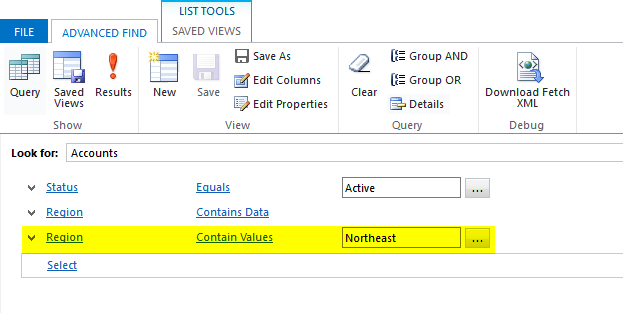 I have opened the Advanced Find window and added the new "Region" field as a column. 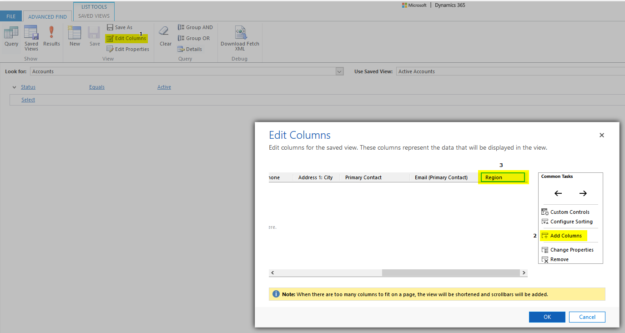 After I added the column, I updated the filter to only show the Active Accounts with data in the Region field. When I view the results, I can see only Accounts with data in the Region field. Now, let's take this a step further. I updated the filtering to show specific values within the Region field. When I view the results this time, I can only see Accounts with "Northeast" in the Region field. In prior versions of Dynamics 365 (CRM), this type of functionality was available. You would have to add multiple checkboxes onto a form to allow for the selection of multiple values. If you use the new multi-select field, you can save a lot of space on the form, and simplify the administrative process and form updating significantly. If you should have questions regarding the multi-select field, or other questions related to Dynamics 365 (CRM), reach out to ACE Microtechnology. By the way, now there is also a flexible alternative to the out-of-box multi select. It is based on N:N relations & FetchXml, and does not contain “OptionSet related limitations”. Thank you for the information! This is certainly another option in to have in the Dynamics 365 “toolbox”.